In 1884 a small group of students at the University of Rochester founded the Independent Literary Society. Four years later, the group changed its name to the Phothepian Literary Society, and adopted the motto “Follow the Light”. As they gained influence in the University, the Phothepian Literary Society changed its name to Phi Epsilon Fraternity, secrecy became the watchword, and was incorporated as a fraternity in 1902 under the laws of New York State. Although the ideal of Phi Epsilon was scholarship, they sought the genuine all-round college man for membership. Meetings were held in the homes of various members until 1911 when membership had grown so rapidly that the house at 13 Upton Park, two blocks from campus, was purchased. Phi Epsilon grew rapidly and soon became influential in the life of the student body at Rochester. In March 1920, Phi Epsilon petitioned Theta Chi for a charter, which was granted in May 1920 and installed June 11, 1920. The Phi Epsilon pin was similar to the diamond-shaped Theta Chi pin. In the center was a raised diamond-shaped field, on which, near the top, was a star, and near the bottom a lamp. Through the middle ran a band with the Greek letters Phi and Epsilon. The colors were pale blue and white. 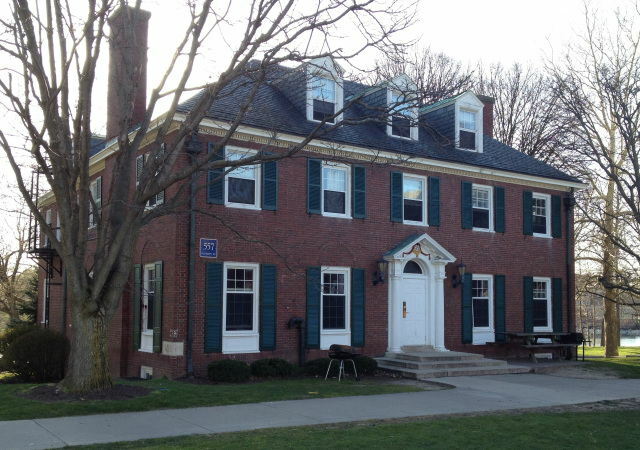 In Spring of 1927 Theta Chi moved to a rented house closer to the fraternity center at 27 Prince Street and after the University moved to the River Campus in 1930, the current Alpha Zeta Chapter house was occupied in 1931.